Whether you need it for the factory production line, office, or laboratory, a multifunctional digital scale can assist you with a host of different weighing needs, whether you intend on measuring solids or fluids, or both. Multifunctional digital scales come in an assortment of price points, capacities and resolutions, so careful research is in order before a final purchase is made. Easy to read; LCD display is preferred and almost universal among available models of multifunctional digital scales. A backlit display for use in low light is even more useful, as well as display digits that are at least 1′ high. Graphics displays are the most desirable. Easy to use; special buttons and functions such as the tare function or weigh/hold function should be simple to find and utilize. You shouldn’t need to read the manual every time you want to weigh something. Made of the most durable materials. Many scales you find will have a stainless steel platform, which is very strong and long lasting material that can be easy cleaned. 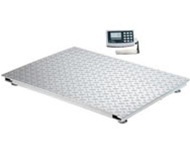 A removable plate, tray or platform will only increase the life of your scale and is also recommended when available. Most importantly, stainless steel load sensors will provide the most trouble free, long term operation. Have high accuracy. Research the resolution of the multifunctional digital scale – is it accurate at 1 gram increments or 100 gram increments? Depending on for which purpose you plan on using your scale, this could make a huge difference. Do what you need it to do. If you will be weighing predominately small items, you can get away with buying a top loading digital scale that is meant to sit on a table or countertop. If you need to even occasionally weigh big objects, such as animals, people, pallets, or drums, a larger digital platform scale will be necessary. Some of these multifunctional digital platform scales come with wheelchair ramps, handrails and seats, and some are also outfitted with casters so they can be rolled around from place to place. These aren’t requirements, but are definitely assets that will save time, patience and money. Tare feature; tare functions will automatically subtract the weight of a container with the push of a button. This not only saves time but aids in accuracy – human mathematical errors are no longer an issue. Automatic shut down conserves energy and saves money, especially if the scale is battery powered only. A hold function shows the weight of the item even after the object has been removed from the scale, sometimes for several minutes. Warranty. If you are planning to invest hundreds of dollars on a multifunctional digital scale, it is probably wise to protect that investment through a warranty.